Tap dancer Annie Peacenik isn’t just randomly entertaining Maxwell Street Market shoppers as she stands om a bustling city corner — she’s considers her work to be the preservation of an American art forms. Amid the jumbled strains of Mexican music blaring from boom-boxes and the mixed noises of a busy city, the 20-something Peacenik has found her stage on three-by-four piece of plywood laid next to a bus stop. After beginning to tap at the age of nine, Peacenik went on to study the history of tap dancing in college and has continued to study other forms of dance, such as modern dance, in more recent years. Recently, she’s been working on writing the biography of her mentor, Harold Cromer. Cromer, who began his 50-year dancing career as a tap dancer on roller skates at the Hudson Guild in the Hell’s Kitchen section of New York City, went on to become a member of the dance and comedic duo Stump and Stumpy. Even though he’s over 90 now, he still dances every day, Peacenik said. “He complains about his knees and grumbles that he’s shuffling and all that, but then he’ll turn around and joke ‘at my age of 47, what more can you expect?’ He never let’s on a hint that he’s so much older.” Peacenik said. Despite the unusual location of her tiny dnacing stage, Peacenik has found other music teachers and friends in the crowds of Maxwell Street. One man, Melvin, comes to see her every week and brings an African instrument. As he plays and Peacenik dances, she says she’s been able to learn some of his history as well. However, she’s not always blessed with the ease of dancing to music. Often, when no musicians drop by or her music doesn’t work, she’s forced to dance a capella, with nothing but traffic noise as her metronome. “It’s hard to keep a song in my head with all the noise and then try to also interact with the crowd and say hello to people,” she admits. Though many people who walk by seem not to notice her as they hurry on to purchase the fresh fruit, cooked Mexican meals, imitation designer bags, sunglasses, or any of a variety of garage sale-esque items, a fair number of people do stop and thank her for her work, tossing a few coins or a couple dollar bills her way. Peacenik admits she earns $20 or $30 an hour during the Market. Even on this austere level, without large crowds gathering to hear her, Peacenik said she works to spread understanding and appreciation of dance one person at a time. “I love getting little kids to come dance with me – to make some motion and get them embodying the dance as well – that’s wonderful,” Peacenik describes. Peacenik chose the market as her venue because it’s steeped in history, similar to her art form. She’s been in the same spot for three years. However, just a few minutes earlier, she had been imformed that someone “probably just one vendor,” she guessed, had complained and that she was being forced to either move or get a license in order to remain in her usual spot. There are statues of some of Chicago’s most famous musicians lining the sidewalks of Maxwell Street, but you’ll find the real musicians further down the road. A few feet away from busy Maxwell Market Street, James Washington plays classic blues on his cherry red, electric bass guitar. The suffocating heat does not seem to bother him as he performs in the shade of a small tree. Washington, 72, a slow-moving man with a peaceful face, has been playing the guitar since he was a little boy. He lacks a regular spot on the famous market street, so he plays on the sidewalk, or wherever he can find a couple feet of empty space to set up a stool and rest his small amplifier. Streams of people flow through the marketplace, some trickling down from the crowd to pass by Washington and throw some spare change in his cardboard box. Every so often, sirens blare from the police cars that whiz by, but the noise doesn’t seem to affect Washington’s passion for playing the blues. Some wonder why Washington, by day a construction worker, is isolated from the crowd. It’s because Washingotn and musicians like him are banned by law from playing on this famous street. “Mr. Washington cannot play next to those statue musicians on Maxwell Street, or else he will be arrested,” said Professor Steve Balkin, a Roosevelt University economist. “On that street, there can not be any vendors or musicians because of its historical importance. I feel it’s all about class segregation because the Mayor has replaced the poor people with the rich,” Balkin said. Balkin believes the government should not be so hard on musicians, especially kind-hearted souls like Washington. Maxwell Street has played a big role in Chicago’s history and been famous for its melting pot of ethnicities. Aiding the origination of blues, Maxwell Street helped promote famous musicians like Muddy Waters, serving as the homeland to those segregated during the 1930s and40s. With the development of the Maxwell Street Market, many minorities in need of quick cash came here to perform in the street and earn a livelihood. But in 1994, the original Market Street had to relocate. Due to construction of the University of Illinois, the city council decided “to raise the fee of the market 5000% so that poor vendors can not pay for it,” Balkin said. Falling from 12,000 vendors to 4000 today, the Market Street that was once so gargantuan and diverse has become restricted. Now one-third of its original size, the marketplace has excluded hopeful vendors as well as passionate musicians like Washington. Due to construction of strip malls, high taxes, and the agenda of city hall, the diverse community has suffered. “City hall favors the rich and is the Stalin of Chicago,” Balkin states as he throws some change into the cardboard box in front of Washington’s feet. Washington just shrugs and continues playing the blues, content with his musical performances that bring him a couple of cents every Sunday. It doesn’t take long to find the best taco at the famous Maxwell Street Market. Just ask around and one name always comes up: La Paz. Bite into one of these tacos and it’s a mouthful of cheesy, meaty bliss. No wonder the line stretches a dozen deep during the hottest part of the day. The La Paz taco stand has been operating for the past 17 years. The stand is owned by Pascuala Arroyo, a native of Guerrero, Mexico, who specializes in tacos that come slathered in melted cheese. Eight busy workers hover behind the heat of the stoves dancing in a bee-line pattern that ends in a warm taco folded inside of a paper-thin plate. You see the tortilla dough mixed, flattened, and thrown onto a hot stovetop where it jumps straight over to get filled by your choice of sizzling steak, pork, or beef tongue. Add some lettuce, onion, and cilantro and you’re done. Pour on the home-made salsa and squeeze fresh-cut lime to add extra scorch those taste buds. “Gracias a Dios, I have many customers,” said Arroyo the owner, holding her hands to her heart. Five years ago, James Lolinde thought he was living the American dream.He owned a successful business, had a loving family and adored his occupation. Lolinde says he lost it all, and now sells everything from welcome carpets to Dora the Explorer dolls at the New Maxwell Street Market. You’ll find him there every Sunday hoping to make some extra money to make ends meet. “Because some buyers were investing in a quick rich system, people purchased houses they could not afford and the real estate market bubble bursted,” said Lolinde, while waiting for customers. After escaping from his birth place in Colombia, Lolinde left his family to pursue his passion in real estate. All of his family put their hopes into his success.The oldest of 16 children, Lolinde felt burdened by the pressure of accomplishment. “If I do well, my family does well and when I do bad, my family will suffer,” said Lolinde. Lolinde moved to Chicago for its melting pot of culture, people, and opportunities. And over 16 years he did very well. Lolinde opened a real estate business to support his homemaker wife and two college daughters.But when the real estate market took a downturn, Lolinde was forced to seek alternative career paths. Like many similar real estate agents, Lolinde must now work three times as hard to make ends meet. As one of his new business ventures, he partnered up with friend Ruben Maza and opened an odds-and-ends business at the flee market. It’s a much different venture than real estate, but Lolinde insists that he enjoys running this flea market business. He’s happy to lend his expertise and see the concession grow. But Lolinde is not giving up on his original dream. “I love real estate,” said Lolinde. For now you’ll find Lolinde underneath the shadow of the Maxwell Walgreens.Sandwiched between hundreds of entrepreneurs who want their first American dream to come true, he is waiting to retrieve it for the second time. 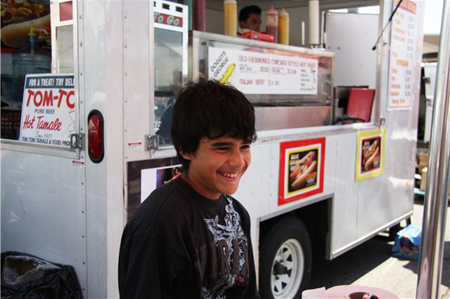 By the time Jorge Romo finishes work at his small, Chicago-based food stand, he has sold more than 270 hot dogs and made about $500 in cash. It’s an impressive feat, considering that Romo is a 14-year-old boy, and his meat peddling skills has earned him a position operating his own serious food business. Despite his age, Romo has taken on the responsibility of personally managing a hot dog stand, its profits and all its workers. The New Maxwell Street Market rests in the shade of the city’s skyline and is filled with the foreign born murmurings of tired Hispanic vendors pushing their wares. Jorge Romo comes here every Sunday, selling hot dogs with all the trimmings to locals and tourists alike. He runs the stand with his mother, but it’s Jorge who handles the day-to-day business while his mother watches. His duties can be difficult at times since people aren’t used to such young entrepreneurs. Romo’s mother got into the hot dog business after moving from Mexico to Illinois at the age of 28. Living in a small apartment, Romo’s mother sold hot dogs and other snacks around her neighborhood, eventually deciding to open her own business. When Romo turned 13, Romo’s mother passed the management duties onto her son. He had been helping her serve food since his toddler years. “I made my first dollar when I was five, and opened a bank account that same year,” Romo said. Romo’s duty as a de facto food manager doesn’t prevent him from having a fulfilling teenage life. He still skateboards with friends and hangs out with them. The stand is only open during the New Maxwell Street Market, which occurs only on Sundays, so Romo is still able to focus on school during the weekdays. While his friends are busy playing videogames, he’s earning a regular income, on the way to becoming as successful individual. He doesn’t plan on selling hot dogs forever. He hopes to finish school and find a new line of work. But in the meantime, he’s the guy to see on a Sunday if you’re craving a hot dog in Chicago.